The Stunticons merge to form the Mighty Menasor and strike fear in to the sparks of Autobots everywhere! Wanna hear what I think about him? Keep reading friends! Menasor's combined mode does an excellent job of showcasing the great design elements of all the individual bots involved. Each limb is unique and easily identified without question. He is a big beefy bruiser, but not without some areas feeling like they are a little lacking. His waist and abdomen seem quite small for my liking and I'm looking forward to seeing what 3p companies can do to help fill him out in the midsection. His problem areas are really his lower abdomen, hips and pelvis. I have transformed his legs in a modified version of the stock transformation, to try and clean up his proportions to be more to my liking. I chose to omit Blackjack as the chest shield for 2 reasons; 1. I prefer the look of the closed chest piece. 2. I can't find a Blackjack anywhere to save my life. Overall I find he looks fairly intimidating and has some really nice design choices. Unfortunately for some that may be overshadowed by poor integration and a clumsy final product. Menasor has all the standard posability you would expect from a combiner, and then some! His head is on a ball joint with a nice range of motion. He has full 360 degree rotation at the shoulders (just be careful not to separate the locked shoulders on Motormaster) His arms can go all the way out 90 degrees. He has double elbows due to using the combiner bots hips and knees for the elbow joints. He has 360 degree wrist swivel as well as some adjustment in the hand due to how the combiner hands work. He actually has a waist joint which is pretty amazing for a completed combiner. It's just Motormaster's waist but it works well enough. His groin plate can be adjusted to your liking and can move out of the way for walking or lunging poses. Unfortunately if you don't peg the flaps on Motormaster's legs into his thighs, which requires his hips to be in the stock transformation scheme, he can have a bit of floppiness and is prone to falling over while you're posing him. His legs go 90 degrees front and back, and he has around 90 degrees of bend on the knees depending on who you are using as legs. When posing this guy for photos the need for ankle tilts is very apparent and I'm looking forward to getting some replacement feet for him. Not much to talk about when it comes to weapons, he has the same combined sword that came with Motormaster. He is also able to wield any number of the other Stunticon's weapons but where some were swords and rifles in the hands of the individual figures, they now look like pea shooters and butter knives in the hands of Menasor. There are a number of 5mm ports all over menasor and his limb bots to store all the weapons from the individual modes. Between his massive sword and the weaponry built in to his hands and feet he's not lacking in firepower but a large rifle or some way to combine the individual weapons would be nice. I think Menasor is an okay toy. He's not going to blow anyone away, and he isn't the strongest addition to Hasbro's Combiner Wars line up. He's an adequate plaything for younger fans and he's a decent display figure for collectors who I'm sure will be looking in to some of the 3p options that help to spruce him up a bit. With so many pictures of Menasor floating around the internet, and now my own adding to the bunch, my best piece of advice with Menasor is to try and get some hands on time with him. This is a toy that unfortunately does not photograph well. I've gone out of my way to really try and capture a few poses that I think can sell the toy, and maybe change a few minds of people who have already written off this set. There's a certain indescribable something about him when you have him in hand that really makes me enjoy the figure and forgive some of it's more egregious flaws. He's a very fun toy to play with and really looks interesting in a neo classics or CHUG collection. I think I like the CW Stunticons as individuals more than as a combined force, but there is a certain charm to Menasor and I am still just absolutely giddy that we are getting mainline combiners again. What are your thoughts on Menasor, the Stunticons, or Combiner Wars as a line? Let me know in the comments section! 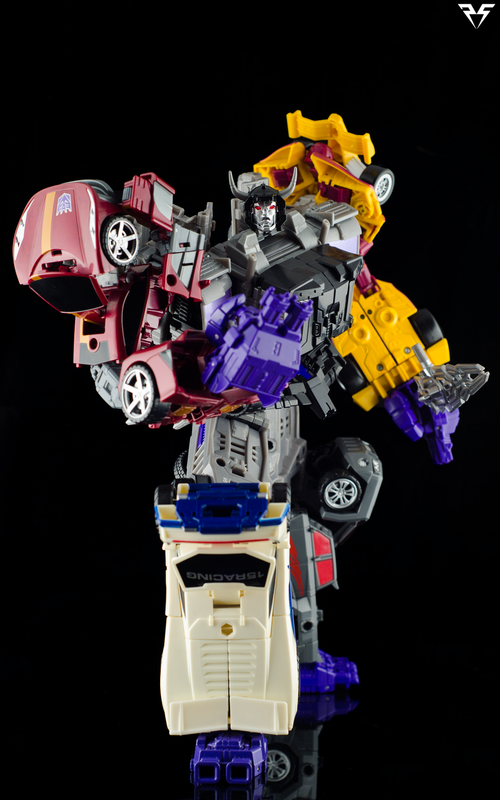 Check out the gallery below for more photos of Menasor, and stay tuned for my next review!